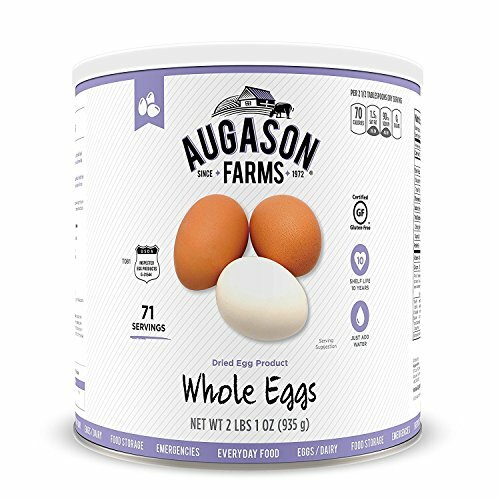 The Augason Farms Dried Whole Eggs are an inexpensive source of high quality protein with an extended shelf life of up to 10 years. It's easy to always have eggs on hand. In addition to being convenient food storage, they're useful in everyday cooking in any recipe that calls for eggs. Use them to make delightful scrambled eggs or French toast, among other things. When used with other dry ingredients, it's not necessary to reconstitute the eggs. Simply add the powder to the other recipe ingredients and increase the water amount appropriately. Consists of 71 servings total and 4,970 calories in an institutional size (#10) can. Augason Farms egg products are USDA inspected. Perfect for Food Storage, Emergencies, Survival, Camping, and Everyday Use! No refrigeration needed, easy to prepare. Non-GMO, Certified Gluten Free. Regardless of the situation, this item is an absolute essential in an emergency. Make the wise decision and let Augason Farms give you a peace of mind that's as indispensable as it is delicious. Augason Farms recognizes that today's consumers are more concerned than ever before about what kind of foods they eat, and want to provide their families with food that is safe and the best quality. Whether enjoying Augason Farm's products for everyday meals, as an emergency food supply, or twenty years down the road, you can be confident that Augason Farms long-term food storage products are guaranteed for quality and taste every time. *Best when stored in a cool, dry and dark place at temperatures between 55°F and 70°F. Actual shelf life may vary based on individual storage conditions.